I love how a simple change can have a great impact on a pattern. In this case, shortening the Pocketful of Posies Dress to a tunic gives it an adorably comfy feel! Fall is quickly approaching, or spring, depending on your latitude. Time to pull out your layering and transition pieces. 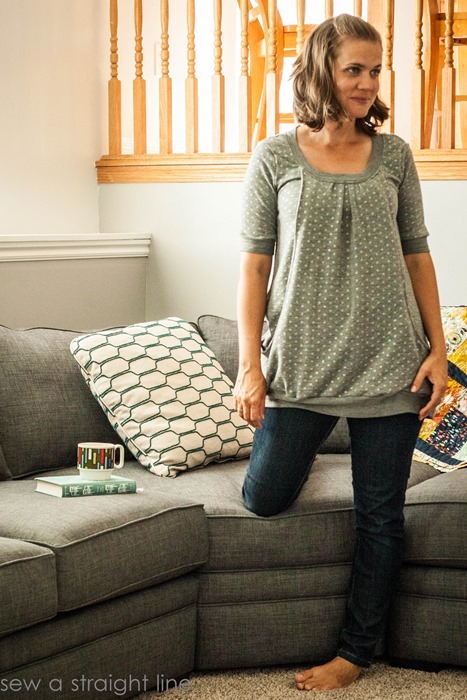 Today, I want to show you a simple and easy take on the Pocket Full of Posies Dress by Blank Slate Patterns that allows for even more versatility in your wardrobe; a tunic perfect for moody-weather days. 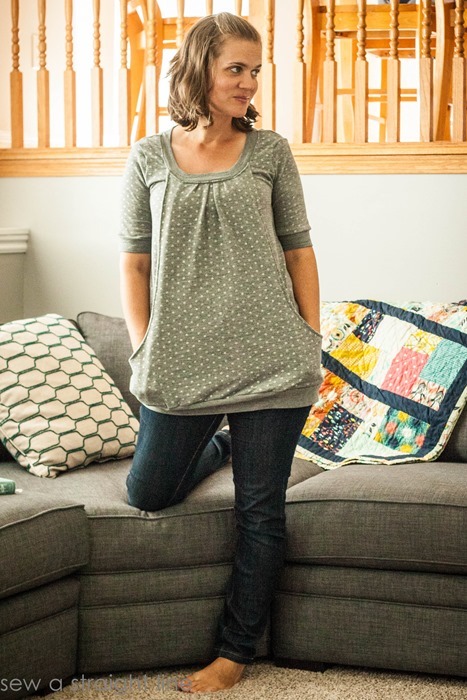 Sewn in a lightweight sweater knit, my Pocket Full of Posies tunic is comfortable and cozy, but still non-committal enough that I can wear it on warm or cool days. I paired it with jeans for this look, but it looks just as fabulous, and wears just as well with leggings or a pair of shorts. It still has all the fun, unique features of the original Pocket Full of Posies pattern. 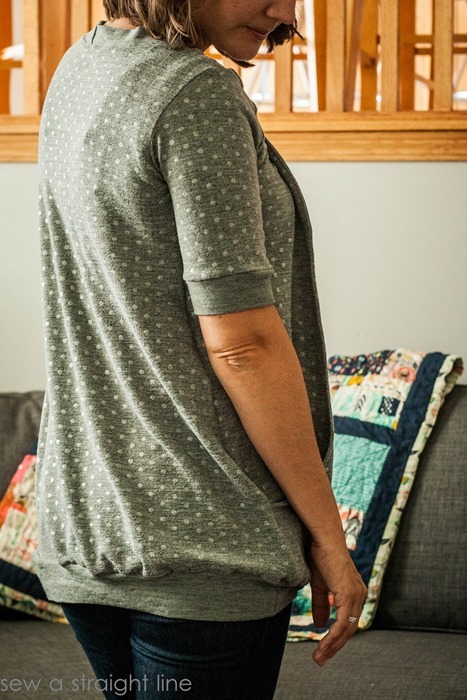 I wore this top with some leggings the other day, and was super grateful for the pockets to stash my cell phone while on a walk with my kids. The front panel gives the Posies an almost vintage feel, kind of like a pinafore. It’s just fun! 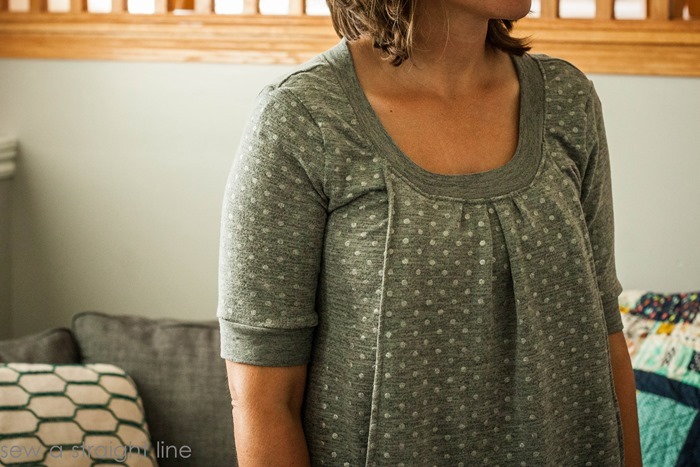 The neckline and the sleeves are my favorite part of this pattern. Sleeves that hit just above the elbow are universally flattering, and I really like the contrast I was able to add at the hem with the cuff. I just used the reverse side of the fabric found on the rest of the garment. I also used the reverse side at the bottom hem and the neck. The shape of the neckline is just fabulous. That deep square-round shows off collar bones without plunging into deep cleavage territory. 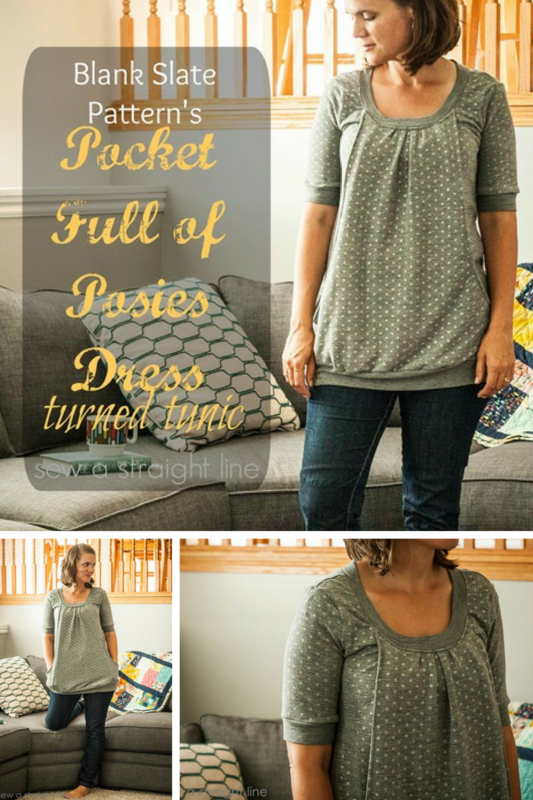 To take the Pocket Full of Posies from dress to tunic, it really couldn’t be more simple. The pattern already comes with two lengths to choose from. The shorter length hits me a couple of inches above the knee. I’m pretty short-legged, so it might be higher for someone else. It makes a super fun little dress. But I wanted something I could get a bit more wear out of, and I wear separates more than anything. 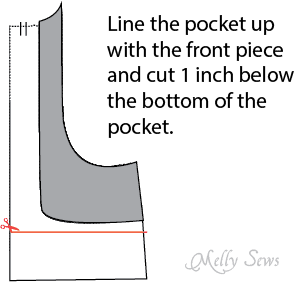 I sliced the pattern to line up all the pieces with the bottom of the pocket facings. This also required me to take the hem band in another inch or so. But that was it. A few inches off the bottom, another off the hem, and I had a tunic! Not a drastic change, and certainly nothing complicated. But those few inches gave me a piece that I can wear with jeans, leggings, or shorts. Now, I just need to make the long length and grab some fun cable knit tights for a winter version, don’t you think?! 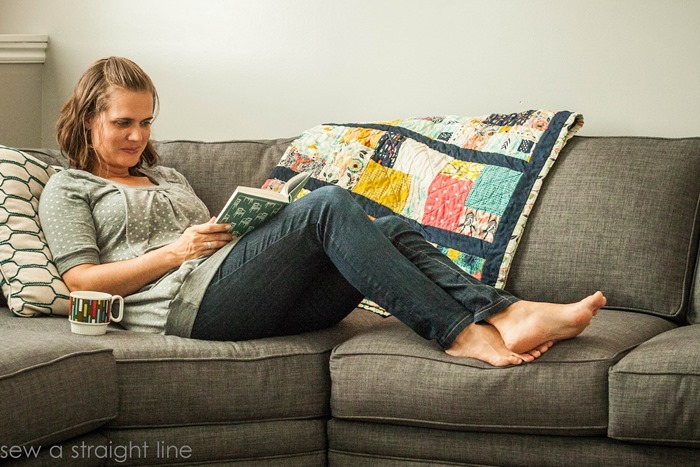 You can grab your copy of the Pocket Full of Posies pattern from Blank Slate Patterns below.